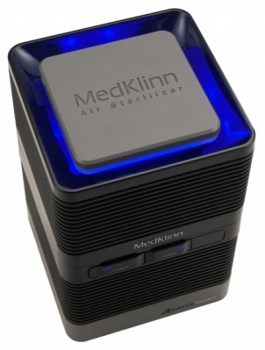 The MedKlinn Asens Air Sterilizers are driven by Cerafusionâ„¢ Technology, the latest in ionization technology. The technology conforms to the relevant stringent electrical safely standards. The Asens Premium is specially designed for indoor use. When the Asens Air Sterilizer is operating, freshness begins to fill the room. This is like the invigorating smell found near a large waterfall or after a thunderstorm, but in much greater measure. Like a gushing fountain, the MedKlinn Asens floods the room with massive amounts of beneficial negative ions. This continuous stream of cleaning ions quickly bind and remove airborne particles, as well as destroying both surface-bound and airborne micro-organisms, leaving in its place a clean, healthy and fresh environment for you and your loved ones. 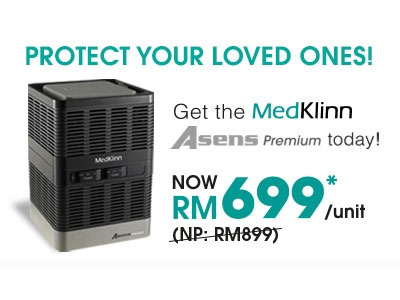 The Asens Premium incorporates a Turbo function which can significantly increase the efficiency and coverage. This function is controlled by a timer with various duration to provide the optimum air cleaning requirement. The Asens Premium, bringing nature back into your living space... enhancing your life.